Street art "is an umbrella term defining forms of visual art created in public locations, usually unsanctioned artwork executed outside of the context of traditional art venues. The term gained popularity during the graffiti art boom of the early 1980s and continues to be applied to subsequent incarnations. Stencil graffiti, wheatpasted poster art or sticker art, and street installation or sculpture are common forms of modern street art. Video projection, yarn bombing and Lock On sculpture became popularized at the turn of the 21st century. The terms "urban art", "guerrilla art", "post-graffiti" and "neo-graffiti" are also sometimes used when referring to artwork created in these contexts. Traditional spray-painted graffiti artwork itself is often included in this category, excluding territorial graffiti or pure vandalism." A mural "is any piece of artwork painted or applied directly on a wall, ceiling or other large permanent surface. A distinguishing characteristic of mural painting is that the architectural elements of the given space are harmoniously incorporated into the picture. Some wall paintings are painted on large canvases, which are then attached to the wall (e.g., with marouflage) ..."
Graffiti "is writing or drawings that have been scribbled, scratched, or sprayed illicitly on a wall or other surface in a public place. Graffiti ranges from simple written words to elaborate wall paintings,..."
"Freelance illustrator and street artist, specializing in small-scale, improvised and (mostly) light-hearted chalk art." Cracks in the sidewalk, plants, and architectural features become the inspiration for, and part of the art. Imagine happening upon any of these images while walking through town, and you just have to smile." "The Colombian capital has been a mecca for street artists since graffiti was decriminalised in 2011. Businesses commission artists, celebrities leave their tag, and you can even join a tour of iconic works." the ‘war on drugs’ and climate change all figure prominently." "Photographer Juancho Torres tours the streets of Comuna 13 in the once notorious city, capturing the graffiti and murals that adorn buildings and walls." "Once rejected, street art is now appearing throughout the city, communicating Thai humour, beauty and social issues to its people. Jason Lai takes a closer look." "Donald Trump’s crackdown has been a terrifying bolt from the blue." A mural about Mexican culture in a Hispanic area of Los Angeles. Muhammad Ali and Secretariat located somewhere in the Commonwealth of Kentucky. Kentucky Rushmore is currently a mural located on the side of the WHY Louisville store at 1583 Bardstown Rd painted by Margaret Morely." "This mural at 1583 Bardstown Road in Louisville, Kentucky, features four world-famous Kentuckians. Muhammad Ali, on the left, was born, died, and lived most of his life in Louisville. Abraham Lincoln was born in Hancock County, Kentucky, although Illinois claims him because he represented their 7th district in Congress. Colonel Harland Sanders was born in Indiana, but put Kentucky on the map with the fried chicken recipe he developed. Secretariat, at the far right, was foaled in Virginia, but the 1973 Triple Crown winner lived most of his life at Claiborne Farm in Paris, Kentucky. The mural was painted by artist Margaret Morely in 2013." 20 works of street art that make you say: how did they even think of this? Street art in Buenos Aires (Coghlan), Argentina by artist Alice Pasquini. "Now, de Casabianca’s projects has become a “world participative project;” artists around the world have been invited to turn characters from forgotten classical paintings into street art, where they might get the renewed attention that they deserve. Artists can even receive small grants to help them with the cost of printing the artwork." "A group of designers from South Korea found a way to fight those gloomy days when it just wouldn’t stop raining. Together with Pantone they brought back the colours to Seoul by creating huge vibrant paintings on the streets which appear when it’s raining. Their project is titled “Project Monsoon” and, as the name suggests, was created for the annual monsoon season when it rains for as long as 3 weeks. The artists used special hydrochromatic paint, which stays invisible until it gets wet." "In the late 1970s and early '80s, photographers Martha Cooper and Henry Chalfant were both documenting the work of graffiti artists on the subway system of New York." "Almost every day, at least one new street art piece pops up in Shoreditch, the area of London most populated by street art and graffiti." The Lennon Wall or John Lennon Wall, "is a wall in Prague, Czech Republic. Once a normal wall, since the 1980s it has been filled with John Lennon-inspired graffiti and pieces of lyrics from Beatles' songs. Today, the wall represents a symbol of global ideals such as love and peace...."
“Monzter“ is a picture book for the iPad. It is Kim’s first work focusing on children. He created the numerous pieces in abandoned factory buildings outside of Berlin." it is often business that has created the platform for expression." "David Lynch, that champion of the arts, says graffiti is ruining the world. And he’s right – this hypermasculine display is destroying our environment." 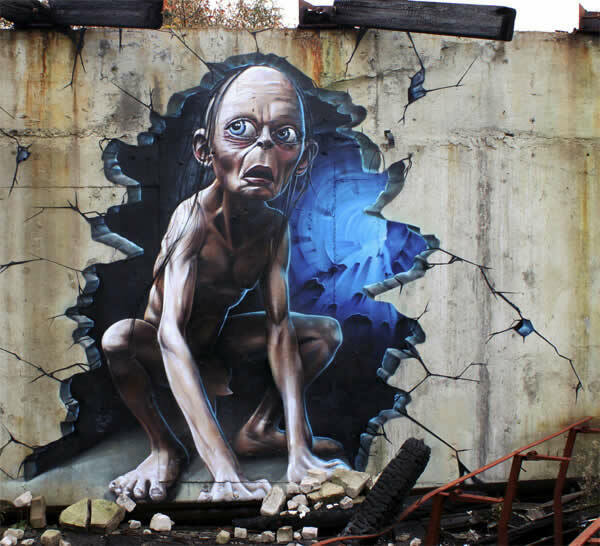 "A successful property surveyor was jailed this week after his secret life as a tagger was uncovered. But he wasn't unusual – lots of us are middle-aged family men with good jobs." "For graffiti writers the ever-dwindling rewards and ever-increasing penalties are ending the romance." a much-admired and now reissued photo book traces the story of Britain’s graffiti pioneers." "Street artists are showing how they’d map cities differently in a new show that lets visitors step into their clandestine worlds. Conventional cartography this is not .."
funded by the European Commission's Humanitarian Aid and Civil Protection (Echo), and the UN children's charity Unicef." "Dans la banlieue de Damas se trouve le plus grand mur décoré à base de récupération du monde. Avec ses 720 mètres, il est rentré dans le Guinness book des records." Street Art Utopia - "a street art blog. Artists from around the world post their work and collections on this site." "Red Bull presents a collaborative collection of places on Google Street View where street art is present. Anyone who come across street art on their way can tag it on the website and help build the biggest art collection in the world. You must check-out the website and the cool places that are tagged." "This site is designed to showcase the work of a group of men from the Bogside in Derry who are known as - The Bogside Artists®." Haring achieved his first public attention with public art in subways..."
"Explore the picture, watch the videos and visit Keith Haring's website, then play the hangman game." Lee QUINONES "is an American street artist and is known for his work all around New York." "Afghan artist boldly takes to the streets with a spray can and hope for a peaceful future." Batman's Alley - "Groovy graffiti alley in Sao Paulo"
"It is known Batman's Alley and on Google Maps it looks like any of the hundreds of narrow inner streets that twist and turn within Sao Paulo's blocks." "Like an art gallery that has exploded on to the streets, the Museu is made up of a series of huge murals covering 20 buildings, all commissioned by local artists." "Murals have been painted in Northern Ireland for over 100 years. In this documentary, leading murals historian Bill Rolston explains how they adapt to a changing political climate and the changing attitudes of republican and loyalist communities. William Jackson, grandson of one of the first muralists, discusses the sense of identity that murals instill in communities. Others look at murals as a tool for conflict transformation. Jeanette Warke, manager of a youth centre in Derry~Londonderry, describes how they can have a positive impact on younger generations." "A public art project which encourages local artists to create works utilizing the city's architecture has beautified the City of Brotherly Love and created an enduring cultural legacy." "You are the Star" by Tom Suriya. 1. First, click on the picture and watch the presentation. Famous Hollywood stars arel watching you from this mural... See if you can identify some of them. "Watch this mural carefully then play the 2 games." "One nation under CCTV is a complete set of teaching resources designed around an interesting and unusual photograph with activities to activate your students' higher level critical thinking skills. This pack looks at the topics of art and street art. The focus is on developing students' ability to speculate about an image, listen for specific information and summary writing skills." "Spray-painted subway cars, tagged bridges, mural-covered walls – graffiti pops up boldly throughout our cities. And it turns out: it’s nothing new. Graffiti has been around for thousands of years. And across that span of time, it’s raised the same questions we debate now: Is it art? "This web-quest was centered around the concept of relating historical art to popular art of today. This web-quest may easily be extended to a junior high school grade level, so long as the questions, concepts and art vocabulary is simplified..."
"This web quest will widen their knowledge and understanding on what the society called as vandalism. This will help them to create new norms about the problem of society. They will also see the beauty of that new form of art." "A group of south London graffiti artists were jailed last week for up to two years for defacing public property. Yet as they begin their sentences, their work is to be championed by a New York gallery." "Toronto sets up official panel and the wrangling starts over what to preserve." "Over a year ago, when the largest ever epidemic of Ebola began in West Africa, the general belief was that there was "no cure" for the disease. But a unique mural in an Ebola treatment centre run by the medical charity Medecins Sans Frontieres (MSF) in the Liberian capital, Monrovia, shows that the truth is different. Mark Doyle visited the mural with MSF's manager of the treatment centre, Duncan Bell." "Four graffiti artists, a warehouse interior, and an unlimited amount of paint. The warehouse in Brisbane was scheduled to be demolished, so street artists Sofles, Fintan Magee, Treas, and Quench went nuts brightening it up. "In Senegal's capital, Dakar, artists from around the world have gathered for Festigraff, a graffiti festival." "What do you get when you put together high energy teenagers, aerosol cans, and empty walls in blighted neighbourhoods? In Washington DC now, the answer is art - highly professional murals painted on some of the city's most rundown real estate." "Here's an indie documentary from MOCAtv called Building Detroit- Revok, Nekst, Pose that pays tribute to the artist known as NEKST, who started his artistic adventures in Houston and passed away in December 2012 of an overdose.